Go Less, Worry Less, Take Control. Take Daily for Best Results! Helps Reduce, Occasional Leakage Due to Laughing, Sneezing, Exercise, Etc. Are you frustrated when occasional bladder control issues disrupt your life? These issues can come in many forms: that sudden urge to go to the bathroom that interrupts your day or even your sleep...or that unexpected leakage when you sneeze, laugh or exercise. You can take control, with AZO Bladder Control. AZO Bladder Control with Go-Less, a naturally sourced blend that helps you maintain safe and effective bladder control. 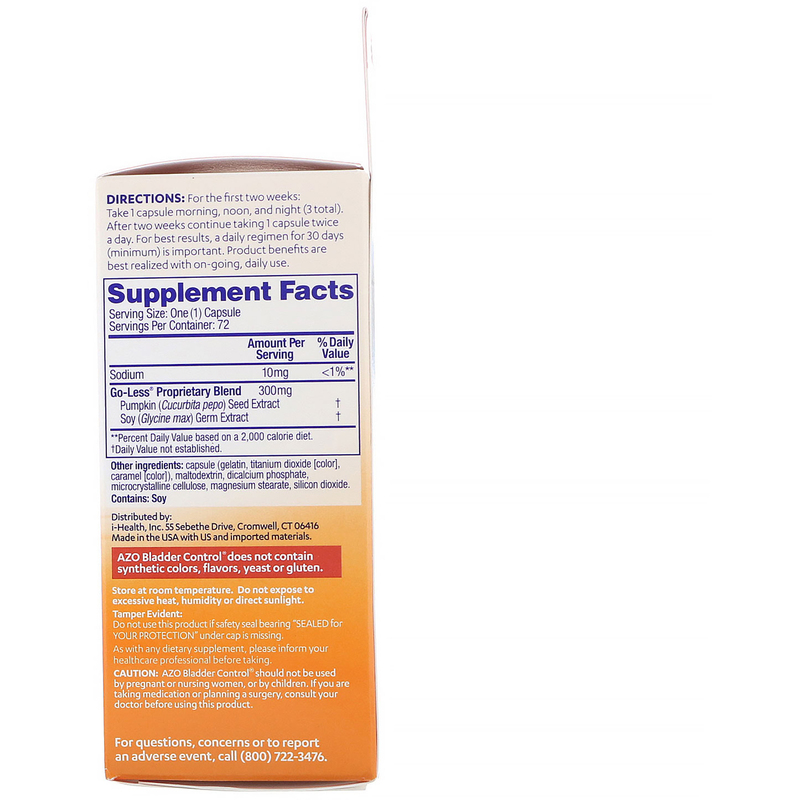 In studies, a blend of pumpkin seed and soy germ extracts are shown to help maintain healthy bladder function. That means help to reduce occasional issues like that urgent need to go or that occasional leakage when you laugh. Stop the worry, and start getting peace of mind with this drug-free, daily blend. 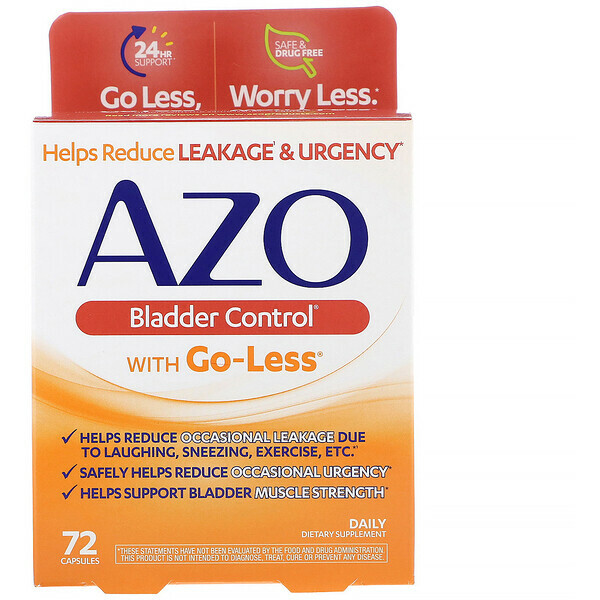 AZO Bladder Control with Go-Less, works during the day and when you sleep at night to help you with around the clock bladder support. Take a step towards getting a better night's sleep, more control over occasional leakage or urgency, and the confidence to own your day. For best results on-going daily use is encouraged. We believe in open, honest conversations about women's health. We believe in helping you take charge of your health. We believe in helping you live your life to the fullest. We believe in delivering the best urinary, vaginal, and bladder health products available. We believe in helping you, own your day. Nas primeiras duas semanas: tome 1 cápsula de manhã, à tarde e à noite (total de 3). Depois de duas semanas, continue tomando 1 cápsula duas vezes ao dia. Para melhores resultados, é importante seguir um regime diário por 30 dias (no mínimo). Os benefícios do produto são melhor obtidos com o uso contínuo e diário. Cápsula (gelatina, dióxido de titânio [cor], caramelo [cor], maltodextrina, fosfato dicálcico, celulose microcristalina, estearato de magnésio, dióxido de silício. O controle da bexiga AZO não contém OGMs, cores sintéticas, sabores, leveduras ou glúten. Tamper Evident: Do not use this product if safety seal bearing "Sealed for your protection" under cap is missing. Caution: AZO Bladder Control should not be used by pregnant or nursing women, or by children. If you are taking medication or planning a surgery, consult your doctor before using this product. ** Porcentagem de valor diário com base em um det de 2.000 calorias.